Spring breakers got rowdy on Miami Beach Friday night. Crowds got out-of-control, forcing Miami Beach Police to shut down some streets. "It was just too much. It was too chaotic. Too many people running. Too many police officers," said Keyona Winter, who is visiting from Atlanta and witnessed a fight. Police said the large group of people started gathering on the sand near beach shore. 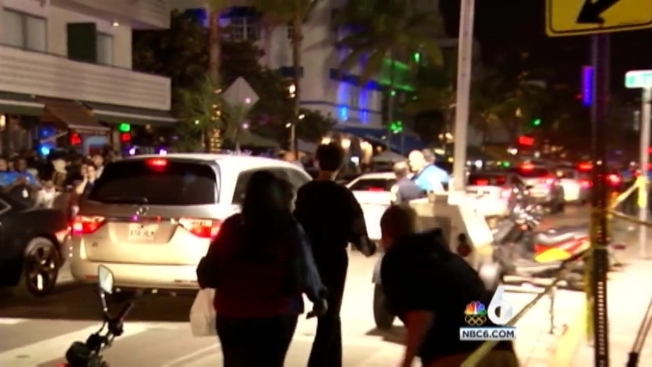 But after sunset, the partiers spilled out onto Ocean Drive and small fights erupted. "At first, everything was starting to get under control but then I guess some people got too rowdy and started trying to fight police," said Jovannie Sweeting, who witnessed the unruly crowds. Police were forced to close down Ocean Drive between 7th and 10th Streets. A few people were arrested but police said it never turned into a riot. MBPD also tweeted a photo of all the spring breakers packed on the beach. Those who witnessed it all said the fights messed with their spring break vibe. "It ruins it. It ruins the vacation when you see a fight because, why are you fighting? We are supposed to be having fun. Why are you fighting?" Winter said. But some said they feel secure knowing police are out patrolling. "Obviously with all the lights, we can tell that the cops are on top of it, so I feel good about that. I'm not worried at all," said Annie Lutterman, spring breaker. Traffic has since reopened on Ocean Drive. Police are urging people to have fun but also be responsible and safe. Update: #Traffic has reopened along Ocean Drive.